It's Tuesday, and I've spent the last few minutes (closer to an hour!) working on a card for the current Tuesday Morning Sketch with a Twist: Use an Animal Image. Chloe is my cat. 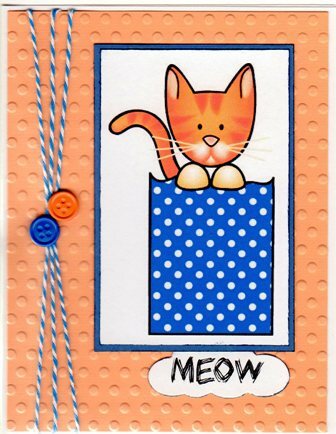 And though she has the coloring of a Siamese in the body of a Domestic Short Hair--and looks nothing like this kitty--I love all cats and really love the collection of cat images including this orange kitty, from Clearly Digi Stamps. This is adorable!! That is such a cute kitty and I love the embossing and what you did with the twine and buttons! Such a delightful and cute card. Great use of our sketch. Thank you for sharing with us in this week's challenge at Tuesday Morning Sketches. Cynthia, what a cutie card! I love this image and your design! Thank you for using our sketch and TWist this week at Tuesday Morning Sketches!